We recognize each project is different and requires a unique approach; creative problem solving is our specialty. The first solution is often not the best, so we take an iterative approach, drawing on many years of experience in historic preservation, architecture, engineering and construction to find what makes sense for your project. Through our work on a wide variety of historic buildings and structures, we’ve developed approaches that minimize the aesthetic impacts of temporary stabilization, both during the project and afterward. Alta Access takes projects from initial concept through the design and engineering phase to installation. Kelly Streeter, P.E, Partner, can provide stamped engineering drawings and calculations to ensure compliance with project requirements. The best solutions are arrived at by working collaboratively with our clients throughout the design and implementation phases. 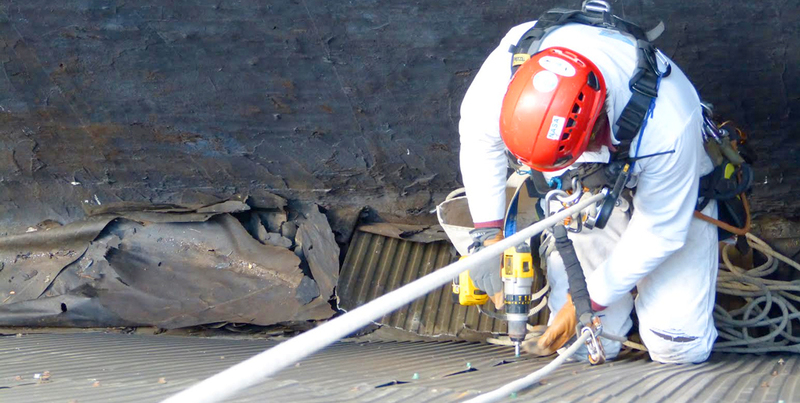 We employ industrial rope access (IRA) techniques to reach difficult to access locations. IRA is an established method of working at height with an extraordinary safety record. IRA minimally impacts occupants and pedestrians, is less expensive and offers more flexibility in difficult to reach locations than pipe frame scaffolding or swing stages. IRA systems rely on double rope techniques to safely gain access to a variety of structures. Technicians anchor ropes to structural members, and descend using two fixed lines to perform the investigation. In general terms, technicians are suspended on one rope termed the “work positioning” line with a redundant “fall protection” line used as backup. Hands-off descent control and fall protection devices are integrated into site-specific rigging systems, along with industry-specific climbing and suspension harnesses. In accordance with applicable law, Alta Access is responsible for the safety of its own employees and develops a site safety plan before beginning all projects. IRA is an undoubtably safer access method than scaffolding or swing stages. According to the Industrial Rope Access Trade Association (IRATA), in 2014 there were “34 injuries, including only six reportable over 7 day injuries, and no major injuries.” In comparison, OSHA states, on average, there are 4,500 injuries and 60 fatalities per year to workers using scaffolding.